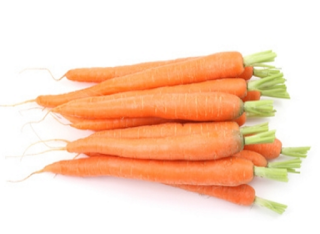 Behind the French Menu: Carottes - Carrots in French Cuisine. Photograph courtesy of USDA Agricultural Research Service. Carrots origins and carrots in France. Carrots came to the rest of the world from Afghanistan. Just about the only good thing that I can think of as having come to us from Afghanistan! Nevertheless, despite their origins carrots are an important part of French cuisine. 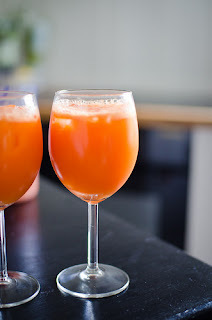 Your day may begin with a glass of fresh carrot juice from a breakfast menu. 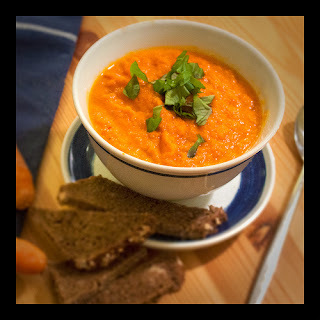 Lunch and dinner menus will include carrots in soups, and salads, and accompanying the main course carrots may be the garnish, or they may flavor a stew, be cooked with a roast or be part of a sauce. Finally, the dessert menu may include Gâteau aux Carottes, carrot cake. 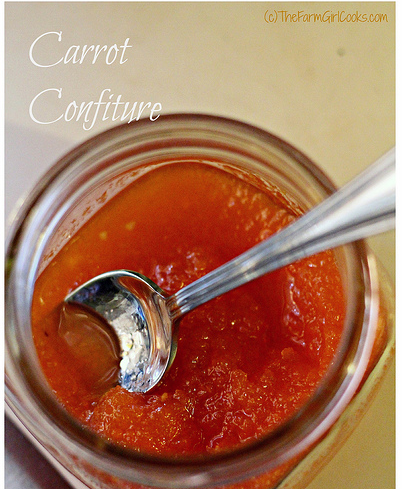 Jus de Carotte - Carrot juice. St Jacques Poëlées à l'Aigre Doux, Carottes glacées au Miel – King scallops lightly fried in a sweet and sour sauce and served with carrots glazed with honey. (Carrots may also be glazed with sugar, butter, olive oil, or syrup). and served with petit pois fattened goose liver, onion sauce and glazed carrots. A plancha or planxa is a thick iron sheet. It is at least two centimeters (6/8”) thick and claimed as their own by the Basques, the French and the Spanish. This popular and very even method of cooking can be done with very little oil and results in a taste somewhere between frying and grilling. Raviolis aux Carottes Confites, Consommé de Jambon et Croustilles de Cheddar - Ravioli filled with carrots confits; that is practically a carrot jam. The ravioli here are served in a ham consommé flavored with crispy and crunchy pieces of Cheddar cheese. Filet de Pangasius sur une Purée de Patates Douces et Courge Musquée, Carottes Nantaise et Fenouil Braisé - Filet of Pangasius, the fish, served with a puree of sweet potatoes, butternut squash, Scarlet Nantes Carrots, and braised fennel. Pangasius, Basa or Panga, is a farmed catfish from Vietnam. The fish is mostly imported as frozen or chilled filets. (see the appendix Fish: Pangasius). Nantes is the sixth largest city in France, and is considered by many Frenchmen and women to be the best city in France to live and work in. It is also famous for the agricultural products including the wine grapes that grow around the town. 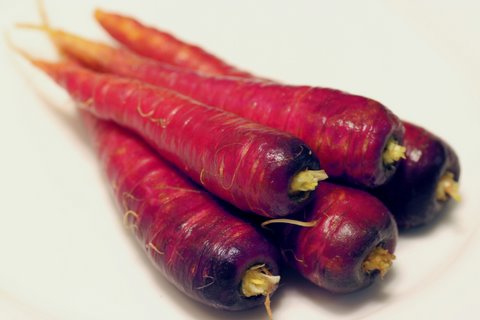 The local farmers developed the Nantes bright orange carrot that comes with a naturally sweet taste. The same farmers are also grow 80% of one of France’s favorite salad greens, mâche, lamb’s lettuce. Filet de Maquereau Mariné, Carottes Nouvelles aux Agrumes – A filet of marinated mackerel served with young carrots and grapefruit. Salade Maraîchère: Tomates, Concombres, Haricots Verts, Coeur d’Artichauts, Pommes de Terre, Carottes Râpées, Oeuf Dur – A market garden salad: Tomatoes, cucumbers, green beans, artichoke hearts, potatoes, grated carrots, hard-boiled eggs. 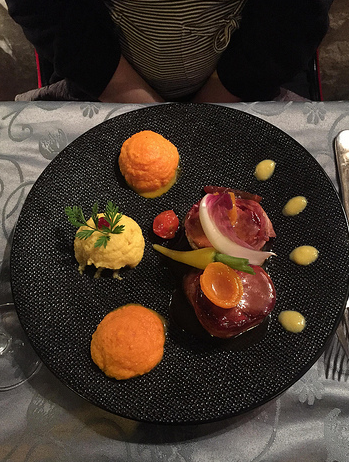 Rôti de Boeuf, Braisé au Pinot Pomme De Terre Au Four, Crème Et Ciboulette, Carottes Vichy. – Roast beef braised with pinot noir wine and served with baked potatoes served with a cream of chives sauce and Vichy carrots. Carottes Vichy is the name given to carrots, boiled in the town of Vichy’s famous lightly effervescent mineral water when served as a garnish glazed with butter. The town of Vichy in the Auvergne is famous for the food products named after it such as Vichyssoise and its mineral water. The town strives to put behind it its infamous role as the center of the French-German collaboration in WWII. Potage aux Carottes Parfumé à l'Orange et au Gingembre – Carrot soup scented with oranges and ginger. Carpaccio de Carottes et sa Terrine de Crevettes – A carpaccio of carrots served with a pate of shrimp. Foie Fras de Canard en Terrine, Carotte Violette Préparée Comme une Confiture. - Fattened duck liver pate served with violet colored carrots prepared as a jam. There is little or no difference between vegetables prepared as a confit or as a confiture; the menu listing is the chef’s choice. Eglefin Fumé, Salade de Lentilles Vertes et Julienne de Carottes – Smoked haddock served with salad of green lentils and carrots julienne. Julienne is one of France’s popular sizes for cut vegetables. Julienned vegetables look somewhat like matchsticks. 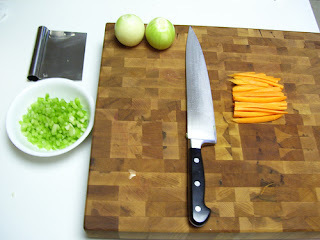 Here the carrots are cut into slices about 2mm square and about 5cm long. Cabillaud Roti, Carottes Pourpre, Croquettes de Blé aux Herbes, Coulis d'Épinard. - Roast cod served with purple carrots croquettes of wheat and herb and a puree of raw spinach. Thon, Sauce Vierge, Mousseline de Carottes, Brunoise de Légumes Poëlés – Tuna served with a sauce vierge, a very fine puree of carrots and 2mm thick cuts of lightly fried vegetables. A mousseline of carrots is a very fine puree of carrots. Before fine metal sieves became available mousseline, muslin, the material, was traditionally used as a fine sieve and gave its name to very finely pureed vegetables, fruits, or mousses. Paleron de Bœuf au Vin Rouge, Purée de Carottes et Panais. A cut from the chuck stewed in red wine and served with a puree of carrots and parsnips. Carottes de Créances, Carottes Sables, Label Rouge - These are France’s most highly rated carrots, and they are grown near the town of Créances close to the Atlantic coast in the department of Manche in Basse-Normandie. Since the 11th-century vegetables have been cultivated in this area by the monks of the nearby Essay Abbey. Today the area, with independent farmers, produces a wide variety of high-quality vegetables including Red Label leeks, the Poireaux de Créances, Label Rouge. The Créances are also the name of the local dunes; here the salt air, sandy soil, and the seaweed mulch the farmers use are responsible for the excellent taste of their vegetables. Google or Bing translate apps make the site readable in English. If you love carrots then on the second Saturday in August, there is the Fête de la Carotte à Créances, the Créances Carrot Festival. . Three km (2 miles) away to the North at Saint-Germain sur Plage, are sandy beaches and many small and good seafood and fish restaurants. Then three km (2 miles) to the east is the Lessay Abbey; the rebuilt version replacing the one destroyed in the French revolution. In July and August, the Abbey hosts many concerts, and from the Abbey, it is a short drive to the small town of Lessay. Lessay has some excellent local restaurants and a dairy that produces a wonderful Camembert Normand, AOP. 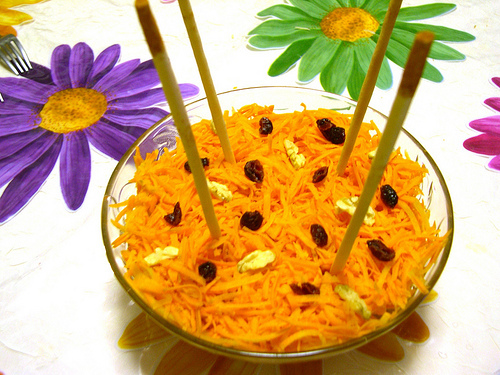 Another French language website covers the carrot fair. Traders brought the carrots to Persia and the Middle East from Afghanistan where the Romans were active. Both the Greeks and the Romans farmed carrots and even noted that they preferred the few orange carrots that occasionally were harvested. The first carrots came in a few shades of mauve; maybe one in a hundred had a slight orange tinge. A few hundred years later either the Greeks or the Romans brought carrots to France. 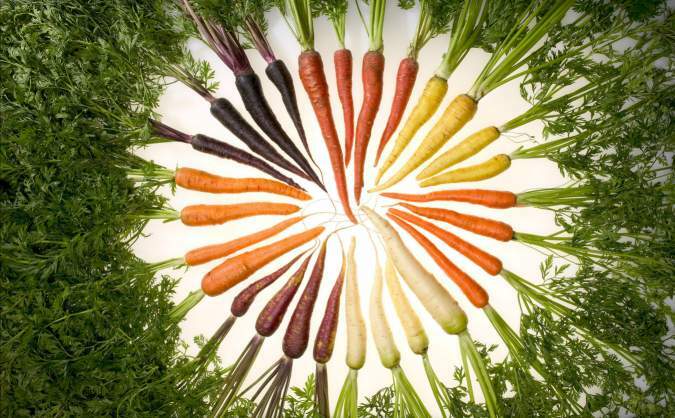 Carrots have been selectively bred over the centuries to produce different colors, reduce bitterness, increase sweetness and minimize the woody core. Despite the cultivation of carrots for over 2,500 years, and their introduction into Europe at least 2,000 years ago, it was not until the 16th century that carrots become popular in France with the orange carrot becoming the most popular. Cultivation has also produced other colors, and in French markets, you may see white carrots, yellow carrots, black carrots and others. Crevettes Shrimps and Prawns; Crevettes in French. Some of the Many Tasty Crustaceans on Your French Menu. Nantes. 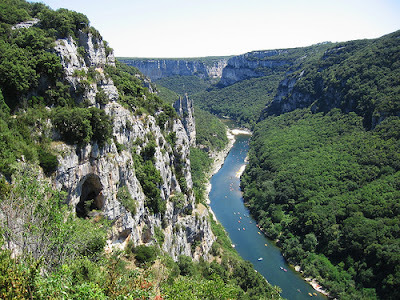 The French City and its Cuisine. A Wonderful Place to Visit and a Wonderful Place to Dine. Pates and Terrines. An introduction to the meat, fish, vegetable and fruit pates on French menus. Rouget Barbet and Rougets de Roche, Red Mullet and Striped Red Mullet, the Fish on French Menus. 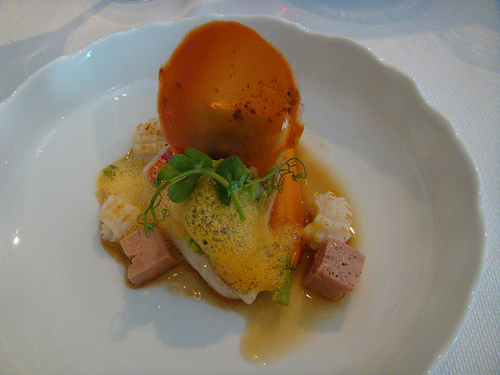 Églefin, Eglefin, Aiglefin, and Haddock, Haddock and Smoked Haddock on French Menus. Soup on the French Menu. A Soup by Any Other Name, but France has So Many Names for Soup.